Are you wondering what has inspired me this last week? Well, you all are my inspiration over and over. Because of that I'd love to thank each one of you personally for being here with me this last two years. Just know that I read each of your comments, laugh with you, cry with you, and hold you dear. I'd love to have a big party where we could all get together and hug, laugh, sit and talk, (and oh yeah, eat...)but since I can't, I just want to say a heartfelt thank you, and share a few things "French" for this celebration! 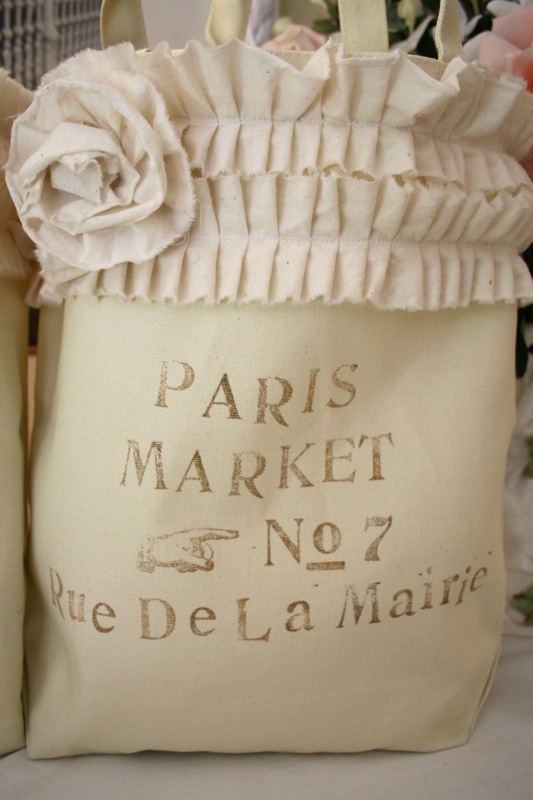 a gorgeous handmade French pillow from Jolie Marche. All for one of you sweet followers out there. To enter, I'm asking that you either "follow" by google or email. 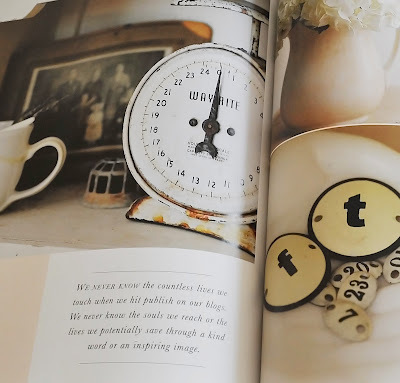 blogged in a post and/or have my button on my sidebar. 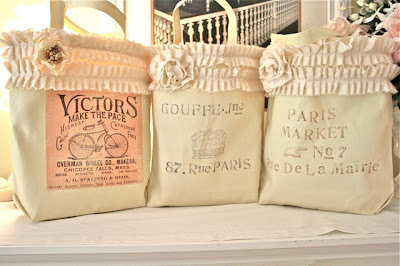 here are her adorable no-sew market bags. Brenda at Cozy Little House has a new Little Blue House. Drop by and be inspired by her "moving" story! desk adorned with French script. has been inspiring us for two years with White Wednesday. with graphics, you'll want to see all of them. has just been published in this edition of Artful Blogging Magazine. Please have a link within your blog post. Debra, you are a wonderful inspiration to all of us! Of course I follow you!! I love your blog! Thank you so much for the chance to win. These look GORGEOUS!! I am a follower who visits all the time and drools over the lovely things you always share! I have put your button on my sidebar! WOW...now I LOVE this giveaway and would so LOVE to be the lucky WINNER:) I'm a happy follower:) Thanks for hosting this fun party...I look forward to it every week. amo lavanda!! lindo giveaway, es encantador! el enlace esta en la barra lateral de mi blog. I love, love, love this giveaway - thank you so much!!! Happy anniversary and what a great giveaway! Thanks and thanks for hosting. What a Great Giveaway... I am a Follower.. I'm new to the blogging world, and I'm so glad I have you as an inspiration! I am a current follower! Thank You! I posted a link of your blog onto mine! Hello, Debra. I've been a follower for a few weeks since I "discovered" you through another's blog. Don't you just love being "discovered"? LOL. 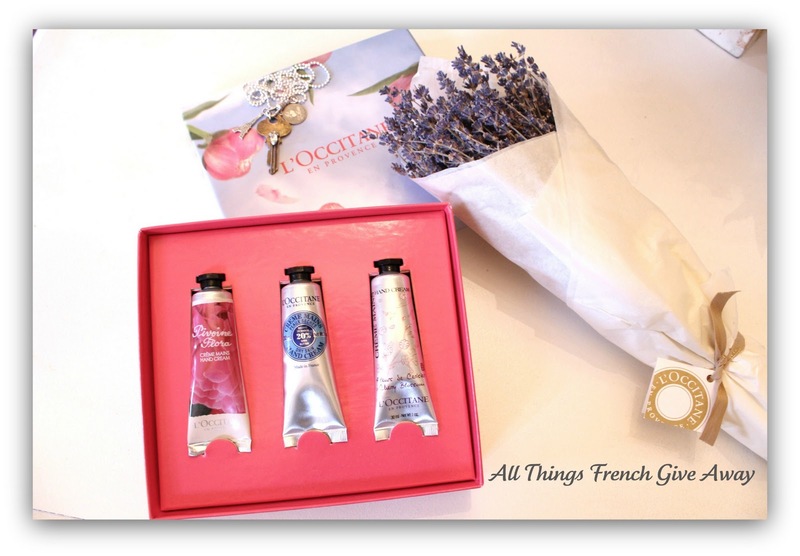 Love your blog, and I would just be thrilled to win these goodies. I would love to win all your wonderful goodies!! Wow! I am a follower. I added a link on my sidebar giveaway list. hey Debra you know I am one of your biggest fans and hometown girlfriends! I am excited about your giveaway! I usually link up each week, and your button is on my blog! Happy Holidays! Oh my! This is a dream giveaway! I just love all you're offering! So wonderful! I am a happy follower! Thank you for hosting! I placed the button for your marvelous giveaway on my sidebar! Thank YOU for taking the time to host your party each week. I know it takes a lot of time and you are very much appreciated! You are such a loving presence here in bloglandia and we celebrate you! Thank you for hosting such a generous and beautiful give away! Of course, I am a long time follower and have you on my blogroll. What a lovely frenchy giveaway. So much pretty! I am a follower. Thanks for an entry. Oh Debra, what a FABULOUS giveaway! I would SO love to win this!! I am a follower of your blog. What great giveaways. I am a follower and always love looking at your blog. I added your giveaway button to my side bar too! I wish I could give you a big hug Debra. You are a great inspiration. I'm already a follower. Thanks for hosting. I posted your button in my sidebar. and thankyou for your kind and sweet words, to all of us. I'm definitely a follower and would love to win this!!! Merci! I just put your button at the top of my sidebar!! I've been a follower for a while and love all the inspirational photos you post, and the fabulous decorating ideas. I also posted your give away button in the side bar of my blog. I love your blog, Debra. Thanks for hosting a fun link party! Your features are always fab! I always enjoy following your blog and posts! LOVE that French script desk! I have your blog on my sidebar too. Debra, I am a follower of your wonderful blog and visit often. Thank you for hosting such a lovely give away. 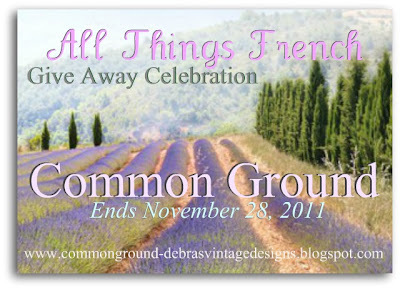 I love anything French and would love to win. Thank you for an additional chance to win. I have posted the give away button on my side bar. Hope I win! i'll enter your giveaway, if you enter mine!! and you know i'm a long time follower! Wow ! Great giveaway ! Hope you pull my name ! Putting your button on my side bar . Happy Two Years of Blogging! I'm a happy follower, Debra and would love to be entered in your give-away. Great giveaway and love those no sew bags, Debra! I am already a follower! Got you on my sidebar, Debra! How lovely your give away button looks on my sidebar! Thanks for the chance to win! I am a faithful follow--but you know that I link up every week! I'd love to win this wonderful prize package, especially that necklace. You are always an inspiration, Debra! I am a follower! I have posted your giveaway on my sidebar! Thanks for hosting! I have been a follower for some time now. I stop in often! I added your button on my sidebar. I am a long time follower and I love your blog! I posted your giveaway button on my sidebar! Good luck too everyone!!!! It's good to be at your party again. Always such great things to see. 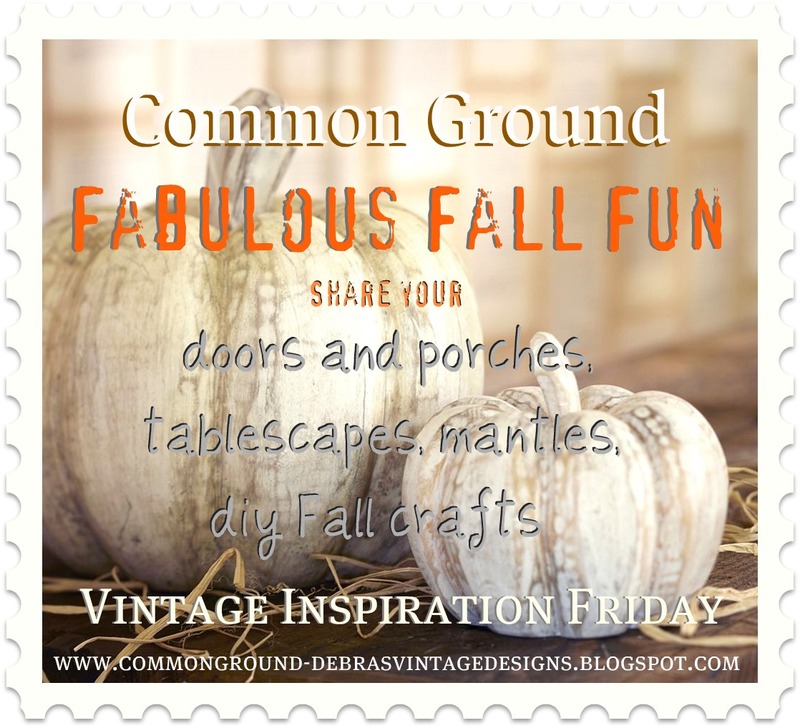 I am a Common Ground follower and your giveaway is awesome - Maybe I will be lucky! Thank you for such a lovely giveaway! Please count me in. I am a follower. What an amazingly beautiful giveaway Debra!! I am definitely a folower. Love what you do!! Love Kathleens window display too! Well how about that... I can't even spell. I am a FOLLOWER...tee hee...AND I just put your giveaway on my blog sidebar. Thanks again so much!! Just posted the giveaway on my sidebar. Thanks for featuring me today Debra:-) I was up adding and fluffing today and the look has changed a bit as things sell. I'd love to be entered into your giveaway. I still think of you as my partner in crime with WW since you've been so faithful for those two years...thanks my friend! I am a follower (in that sense of the word)! Thanks for hosting. And I DO have your latest button at the top of my sidebar. You have a style I only dream of! Be still my vintage heart! I'm a follower! Pamie G.
I have blogged along....love love your blog! These are adorbs. Heart them all. I am a follower. I am a follower through and through!! Thanks so much for the chance to enter this adorable giveaway. This one will be a tough one to win. So many people LOVE your blog and we Thank YOU for all you do to make us happy. Congrats. Oh, I AM a Follower!!! Ooh-la-la....what a fantastic giveaway! Yes, I am a follower. Congratulations on two wonderful years. I'm a very happy follower and appreciate the opportunity to win these gorgeous treasures. I have your giveaway button on my sidebar. Quite a bunch of goodies in this giveaway! Congratulations on two great years of blogging. hello, Debra, i am already a follower and my heart jumps at the thought of winning these gorgeous treasures! What an incredible giveaway Debra! Thoughtful and filled with beautiful treasures. :-) Speaking of which, those are some amazing features this week and we love that you shared Anne's poignant accomplishment. Thanks so much for being such a gracious hostess! Oooh lala, Debra! Love this sweet giveaway! Thanks for the opportunity, my friend! :) I'm a long time happy follower! your giveaway is now on my sidebar. thanks again! I love everything french! I am a follower, thanks for the chance to win! Congrats on 2 years! I wish your blog wasn't so good b/c then I might get more sleep! ;o) Hope you blog alot longer. Following on Google. Debra ~ you're so sweet. I'd love to win one of your necklaces! And thank you for hosting VIF. Blessings. Wonderful post! My best regards from Romania! What a wonderful giveaway Debra. I am a long time follower and drooler. Thanks for hosting another fabulous party! Your giveaway button is proudly posted on our sidebar. I enjoy every post on your blog. Following it is a joy! Well I guess I am your newest follower though I have been following for a long time now. I never knew there was a difference between GoogleConnect and the follow button at the top of our blogs!? I need to research that more. Congrats and so glad I found you. I just love stopping by to visit! Just placed your button on my sidebar! Have a fab Friday Deborah! Of course I am a follower, been there since year one! Great giveaway! Thanks so much for the chance to win this FABULOUS giveaway. Wow....what a great group of prizes! I covet every one of them! I'd snag your button, but my blog is on teaching oil painting....however...I read every post as a treat for myself! I love following your blog. You always have the best pictures, I would love to win one of your wonderful necklaces. I'm a long time follower and I'm lovin' it! Adore your necklace! Count me in please! Your giveaway is on my sidebar! I'm happy to spread the word! I am a follower as well, and couldn't possibly ignore this fabulous giveaway. Your necklace is the thing I am drooling over at the moment. Putting your button with link to this post on my sidebar in just a minute. Two years, congratulations! This is a fabulous giveaway and I would LOVE to win! I am a follower and have your button in my sidebar. what a yummy giveaway. I am of course a happy follower. Fantastic giveaway. I could only be so lucky to win. I've been hopping over here for months you just didn't know it, but today signed up to follow via e-mail. I'd love to win the goodies. Awesome giveaway! I'm your follower. Hi Debra... I have your little giveaway button posted on my sidebar... :-) I'm having a giveaway tooo.... come on over... lots of creamy things. Have a great weekend.......and thanks for hosting this lovely party. You are a DOLL for mentioning my giveaway, sweet sister! Consider your beautiful button grabbed and slapped on my sidebar. such a generous give away, debra! i posted your cute button:) thanks for hosting, and for all the beauty! I added it to my latest blog post and side-barred it! 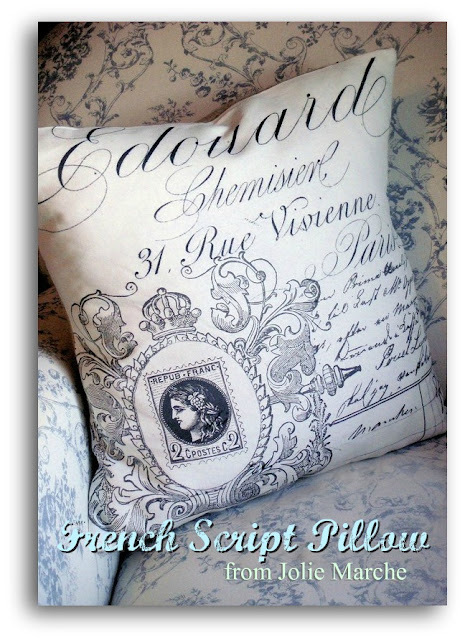 that French Script pillow is amazing! I posted your giveaway button on my sidebar. What a beautiful give away. 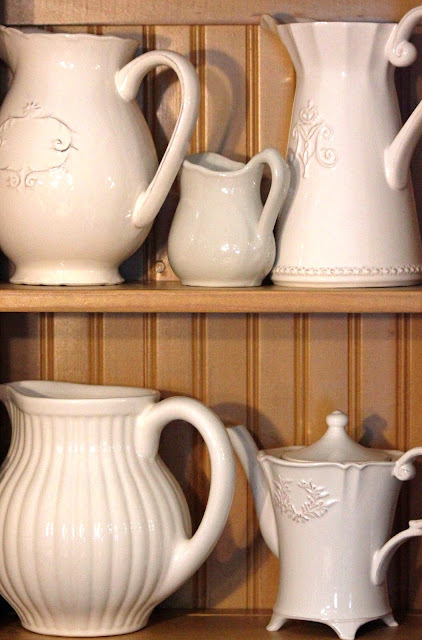 And, yes I so enjoyed your friend Anne's article in Artful Blogging. Love all that you do for all of us out here. Happy weekend to you. Lovely giveaway, Wow! Thanks for the chance and now I'm off to explore the above entries.......:). Have just discovered your delightful site! Looking forward to exploring it further as one of your latest followers!!! Came over from F and T's beautiful blog, think i'll be sticking around! I follow by email...thanks for the chance to win! Great giveaway! I'm a follower of your inspiring blog. I'm now a follower. Love the necklace! Congratulations, Debra! You are loved, you know! :) You always have the best giveaways, sweetie! Thanks for this one! :) I've been a happy follower of yours for a long time! Debra, What an amazing giveaway! Of course I am a follower and I hope you will drop by and enter my giveaway starting tomorrow. Debra, I am posting your giveaway button on my sidebar. Your blog is one of my absolute favorites... I'm definitely a follower! Great giveaway. I am a follower, please enter me. Looks like I'm at the right place for your wonderful giveaway!! Oo La La! What a beautiful giveaway Debra! Thank you for the chance, I'll be keeping my fingers crossed! Wow what Frenchy Fabulousness my friend! Such a gorgeous give away and such beautiful features! Of course we follow you...to the ends of the earth! ;) Just put the giveaway up on our Facebook page to help spread the word! I follow your blog by email. I didn't know you could do that before and was getting it by another email reminder program that I use. I have switched it over now. Thanks, this will be much easier. You know I'd follow you anywhere Debra!!! Oh Debra, what a divine giveaway! You know you can count me in! And your button looks BEA-U-TI-FUL on my sidebar! I am a new follower. Now to go do a little hopping around these links. Mai oui, please count me in your gracious 'All Things French' giveaway. Moi mari est Canadien Francois au Canada and if I should be on the receiving end I would be delighted with your PENDENT as it is all things I love. Blue is my favorite colour and the pillow would fit right in with the blue velvet love seats; getting old now as we have had them many, many year and a new pillow would be just like a great pick-me-upper for My Dear One's loveseat. I have fallen in love with all things about the Eiffle Tower since I viewed the movie on the life of the builder...such a great film. Also another great love is the fleur-de-lis. Thank you for letting us be a part of your life. I am a newer follower but I fell in love with your pendents when I looked at all of them in one of my visits. The one you are offering is tres beau but I also loved the ones where you added a crown, yes, it is another one of my loves...and reminds me of Christ the King and the Crowning of Blessed Mother. I do not have a blog but am thankful to all you sweet ladies who share your talents with us. I am a follower and love your blog... Always an interesting post. This is a special giveaway,Debra! I have been a follower for long time and enjoy your blog. It's always fun and interesting. Thank you. I put your blog button on my sidebar with pride. I love all things french too. Have read your blog for sometime. Am following now. Thanks for the chance. Anne L. was right! You have a great blog with all kinds of wonderful things to see and learn. BTW, what did you do with that gorgeous mirror you picked up at your friend's store/open-house/Christmas time? I'm becoming a follower now. 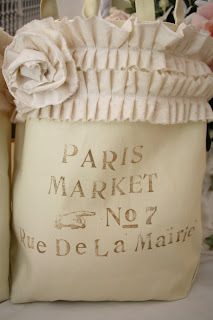 I am a follower (and have been for a while) I also love french finds!! I have this Autumn Beauty "share" button on my blog, and intend on joining in the next few days. November tidings, thanks for the chance to win. You are such a great inspiration I am a Big Follower. Everymorning I wake up early and while my children sleep I will drink my hot cup of coffee and check out your blog. Cheers! I am very new to the bloging world and I have started one myself. I have your Blog in my sidebar! Great giveaway Debra! you always do have the best. I'm already a happy follower. Throw my name in the hat, pretty please! New follower! Come by for some puddin n pie! Oh Debra... Everything French... and such fabulous Creations *swooning*... this Giveaway has my Pulse racing and I've shared it in this Evening's Post so that my Blog Supporters can rush on over and Enter too. How very generous of you and Congrats on such an amazing Blog Journey, I for one always enjoy your Posts and Blog Parties. And here's my separate comment for telling you I've Followed your Blog for some time now and love it... so much Inspiration every Post! I have been a follower of your blog for a while now. This is a wonderful giveaway. Thanks for the chance to win.